Is there a better alternative to XYPosition? Is XYPosition really the best app in Reference category? Will XYPosition work good on macOS 10.13.4? XYPosition is a lightweight application for getting positions on the screen. It shows the position of the mouse cursor in the menu bar. You can change the origin to Top left or to bottom right. To copy coordinates to the clipboard, simple press the hotkey combination cmd+Return. 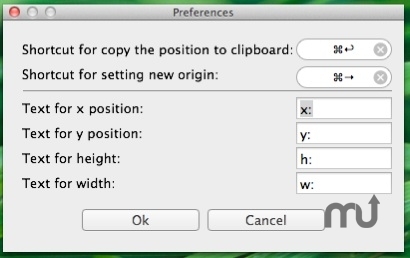 That copies the position to the clipboard with the format e.g. x:993 y:498. To set the origin to the cursor location, just press cmd+right arrow. If you set the origin, you switch to size modus and pressing the hotkey combination cmd+Return will copy the origin and the size to the clipboard e.g. x:656 y:466 h:30 w:35. You can change the text for the clipboard or change the hotkeys: just click on Preferences to customise XYPosition in every detail.